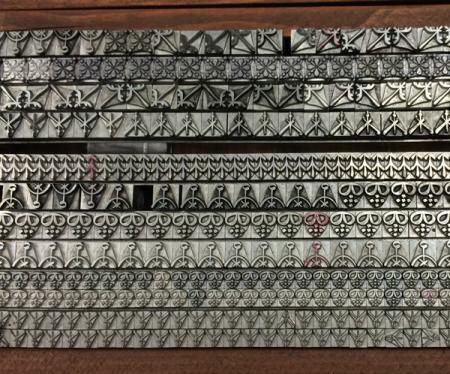 Typefoundry Amsterdam borders: identification and specimen? These borders have “ta” on the pinmarks, so I believe they are Typefoundry Amsterdam. If anyone has access to a catalog, I would be interested in seeing the specimen page(s) for these borders. While they could be simple running borders with corners, it also looks like they could be a more complex suite, and if so it’s always nice to see intended combinations, even if as printers we like to make up our own. Also curious about what era they are from. Does anyone know? Primula Ornamenten they are called in the Handboek van Moderne Drukletterseries, published in 1964. But they already figure in the 1960 edition of the Type Specimen Book, published by Typefoundry Amsterdam. I reckon they’re a mid-1950s design. Thank you so much Thomas! I really appreciate it.